Plato (; Greek: Πλάτων Plátōn, pronounced [plá.tɔːn] in Classical Attic; 428/427 or 424/423 – 348/347 BC) was a philosopher in Classical Greece and the founder of the Academy in Athens, the first institution of higher learning in the Western world. He is widely considered the pivotal figure in the development of Western philosophy. Unlike nearly all of his philosophical contemporaries, Plato's entire work is believed to have survived intact for over 2,400 years. Plato was the innovator of the written dialogue and dialectic forms in philosophy. Plato appears to have been the founder of Western political philosophy, with his Republic, and Laws among other dialogues, providing some of the earliest extant treatments of political questions from a philosophical perspective. Plato's own most decisive philosophical influences are usually thought to have been Socrates, Parmenides, Heraclitus and Pythagoras, although few of his predecessors' works remain extant and much of what we know about these figures today derives from Plato himself. The exact time and place of Plato's birth are unknown, but it is certain that he belonged to an aristocratic and influential family. Based on ancient sources, most modern scholars believe that he was born in Athens or Aegina between 429 and 423 BC. His father was Ariston. According to a disputed tradition, reported by Diogenes Laertius, Ariston traced his descent from the king of Athens, Codrus, and the king of Messenia, Melanthus. Plato's mother was Perictione, whose family boasted of a relationship with the famous Athenian lawmaker and lyric poet Solon. Perictione was sister of Charmides and niece of Critias, both prominent figures of the Thirty Tyrants, the brief oligarchic regime, which followed on the collapse of Athens at the end of the Peloponnesian War (404–403 BC). Besides Plato himself, Ariston and Perictione had three other children; these were two sons, Adeimantus and Glaucon, and a daughter Potone, the mother of Speusippus (the nephew and successor of Plato as head of his philosophical Academy). The brothers Adeimantus and Glaucon are mentioned in the Republic as sons of Ariston, and presumably brothers of Plato, but some have argued they were uncles. 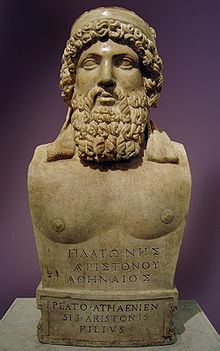 But in a scenario in the Memorabilia, Xenophon confused the issue by presenting a Glaucon much younger than Plato. The traditional date of Plato's birth (428/427), the year after the death of prominent Athenian statesman Pericles, is based on a dubious interpretation of Diogenes Laertius, who says, "When [Socrates] was gone, [Plato] joined Cratylus the Heracleitean and Hermogenes, who philosophized in the manner of Parmenides. Then, at twenty-eight, Hermodorus says, [Plato] went to Euclides in Megara." As Debra Nails argues, "The text itself gives no reason to infer that Plato left immediately for Megara and implies the very opposite." In his Seventh Letter, Plato notes that his coming of age coincided with the taking of power by the Thirty, remarking, "But a youth under the age of twenty made himself a laughingstock if he attempted to enter the political arena." Thus, Nails dates Plato's birth to 424/423. Ambrose believed that Plato met Jeremiah in Egypt and was influenced by his ideas. Augustine initially accepted this claim, but later rejected it, arguing in "The City of God", that "Plato was born a hundred years after Jeremiah prophesied." Hebrew-language chronology works argue that, based on seder hadoroth chronology, Jeremiah's final year of prophecy was 411 BCE (3350 HC), at which time Plato was a teenager and that he initially perceived Jeremiah to be absurd. 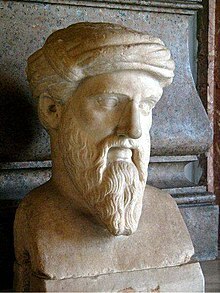 Pythagoras held that all things are number, and the cosmos comes from numerical principles. The physical world of becoming is an imitation of the mathematical world of being. These ideas were very influential on Heraclitus, Parmenides and Plato. 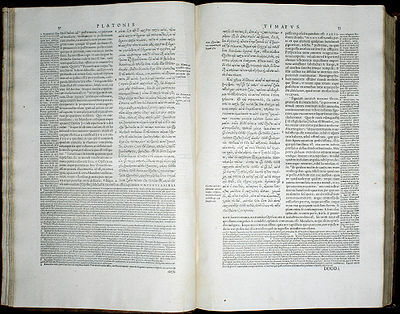 Aristotle claimed that the philosophy of Plato closely followed the teachings of the Pythagoreans, and Cicero repeats this claim: "They say Plato learned all things Pythagorean" (Platonem ferunt didicisse Pythagorea omnia). These two philosophers, following the way initiated by pre-Socratic Greek philosophers like Pythagoras, depart from mythology and begin the metaphysical tradition that strongly influenced Plato and continues today. These ideas about change and permanence, or becoming and Being, influenced Plato in formulating his theory of forms. According to this theory, there is a world of perfect, eternal, and changeless forms, the realm of Being, and an imperfect sensible world of becoming that partakes of the qualities of the forms, and is its instantiation in the sensible world. Mythos and logos are terms that evolved along classical Greece history. In the times of Homer and Hesiod (8th century BC) they were quite synonyms, and contained the meaning of tale or history. Later came historians like Herodotus and Thucydides, as well as philosophers as Parmenides and other Presocratics that introduced a distinction between both terms, and mythos became more a nonverifiable account, and logos a rational account. Plato, being a disciple of Socrates, and a strong partisan of philosophy based on logos, it seems that should have avoided the use of myth-telling. Instead he made an abundant use of it. This fact has produced analytical and interpretative work, in order to clarify the reasons and purposes for that use. Plato, in general, distinguished between three types of myth. First there were the false myths, like those based on stories of gods subject to passions and sufferings, because reason teaches that God is perfect. Then came the myths based on true reasoning, and therefore also true. Finally there were those non verifiable because beyond of human reason, but containing some truth in them. Regarding the subjects of Plato's myths they are of two types, those dealing with the origin of the universe, and those about morals and the origin and fate of the soul. It is generally agreed that the main purpose for Plato in using myths was didactic. He considered that only a few people were capable or interested in following a reasoned philosophical discourse, but men in general are attracted by stories and tales. Consequently, then, he used the myth to convey the conclusions of the philosophical reasoning. Some of Plato's myths were based in traditional ones, others were modifications of them, and finally he also invented altogether new myths. 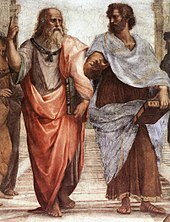 As old man, Plato (left) and Aristotle (right), a detail of The School of Athens, a fresco by Raphael. Aristotle gestures to the earth, representing his belief in knowledge through empirical observation and experience, while holding a copy of his Nicomachean Ethics in his hand. Plato holds his Timaeus and gestures to the heavens, representing his belief in The Forms. Plato often discusses the father-son relationship and the question of whether a father's interest in his sons has much to do with how well his sons turn out. In ancient Athens, a boy was socially located by his family identity, and Plato often refers to his characters in terms of their paternal and fraternal relationships. 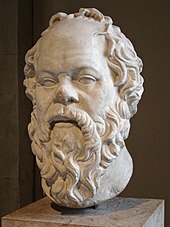 Socrates was not a family man, and saw himself as the son of his mother, who was apparently a midwife. A divine fatalist, Socrates mocks men who spent exorbitant fees on tutors and trainers for their sons, and repeatedly ventures the idea that good character is a gift from the gods. 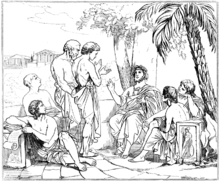 Plato's dialogue Crito reminds Socrates that orphans are at the mercy of chance, but Socrates is unconcerned. In the Theaetetus, he is found recruiting as a disciple a young man whose inheritance has been squandered. 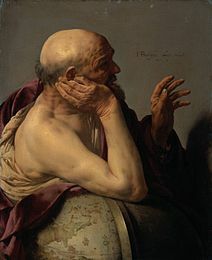 Socrates twice compares the relationship of the older man and his boy lover to the father-son relationship (Lysis 213a, Republic 3.403b), and in the Phaedo, Socrates' disciples, towards whom he displays more concern than his biological sons, say they will feel "fatherless" when he is gone. The theory of Forms (or theory of Ideas) typically refers to the belief that the material world as it seems to us is not the real world, but only an "image" or "copy" of the real world. In some of Plato's dialogues, this is expressed by Socrates, who spoke of forms in formulating a solution to the problem of universals. The forms, according to Socrates, are archetypes or abstract representations of the many types of things, and properties we feel and see around us, that can only be perceived by reason (λογική). (That is, they are universals.) In other words, Socrates was able to recognize two worlds: the apparent world, which constantly changes, and an unchanging and unseen world of forms, which may be the cause of what is apparent. 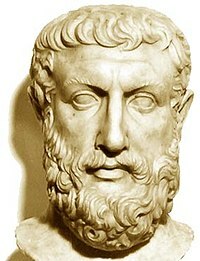 Some of Plato's most famous doctrines are contained in the Republic as well as in the Laws and the Statesman. Because these doctrines are not spoken directly by Plato and vary between dialogues, they cannot be straightforwardly assumed as representing Plato's own views. Productive (Workers) – the labourers, carpenters, plumbers, masons, merchants, farmers, ranchers, etc. These correspond to the "appetite" part of the soul. In the Timaeus, Socrates locates the parts of the soul within the human body: Reason is located in the head, spirit in the top third of the torso, and the appetite in the middle third of the torso, down to the navel. Socrates describes these "philosopher kings" as "those who love the sight of truth" (Republic 475c) and supports the idea with the analogy of a captain and his ship or a doctor and his medicine. According to him, sailing and health are not things that everyone is qualified to practice by nature. A large part of the Republic then addresses how the educational system should be set up to produce these philosopher kings. Their account is in full agreement with Aristotle's description of Plato's metaphysical doctrine. In Metaphysics he writes: "Now since the Forms are the causes of everything else, he [i.e. Plato] supposed that their elements are the elements of all things. Accordingly the material principle is the Great and Small [i.e. the Dyad], and the essence is the One (τὸ ἕν), since the numbers are derived from the Great and Small by participation in the One" (987 b). "From this account it is clear that he only employed two causes: that of the essence, and the material cause; for the Forms are the cause of the essence in everything else, and the One is the cause of it in the Forms. He also tells us what the material substrate is of which the Forms are predicated in the case of sensible things, and the One in that of the Forms—that it is this the duality (the Dyad, ἡ δυάς), the Great and Small (τὸ μέγα καὶ τὸ μικρόν). Further, he assigned to these two elements respectively the causation of good and of evil" (988 a). The works are usually grouped into Early (sometimes by some into Transitional), Middle, and Late period. This choice to group chronologically is thought worthy of criticism by some (Cooper et al), given that it is recognised that there is no absolute agreement as to the true chronologicity, since the facts of the temporal order of writing are not confidently ascertained. No one knows the exact order Plato's dialogues were written in, nor the extent to which some might have been later revised and rewritten. A significant distinction of the early Plato and the later Plato has been offered by scholars such as E.R. Dodds and has been summarized by Harold Bloom in his book titled Agon: "E.R. Dodds is the classical scholar whose writings most illuminated the Hellenic descent (in) The Greeks and the Irrational ... In his chapter on Plato and the Irrational Soul ... Dodds traces Plato's spiritual evolution from the pure rationalist of the Protagoras to the transcendental psychologist, influenced by the Pythagoreans and Orphics, of the later works culminating in the Laws." The Theaetetus is a peculiar case: a dialogue in dramatic form embedded within another dialogue in dramatic form. 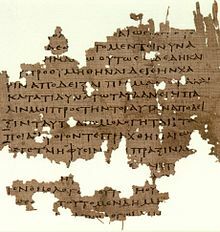 In the beginning of the Theaetetus (142c–143b), Euclides says that he compiled the conversation from notes he took based on what Socrates told him of his conversation with the title character. 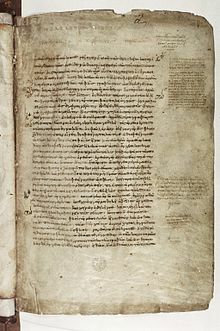 The rest of the Theaetetus is presented as a "book" written in dramatic form and read by one of Euclides' slaves (143c). Some scholars take this as an indication that Plato had by this date wearied of the narrated form. With the exception of the Theaetetus, Plato gives no explicit indication as to how these orally transmitted conversations came to be written down. Plato's Academy mosaic was created in the villa of T. Siminius Stephanus in Pompeii, around 100 BC to 100 CE. The School of Athens fresco by Raphael features Plato also as a central figure. What's the good word on Plato?